That is now virtually true for 2013 as well (Fig. 2, below). 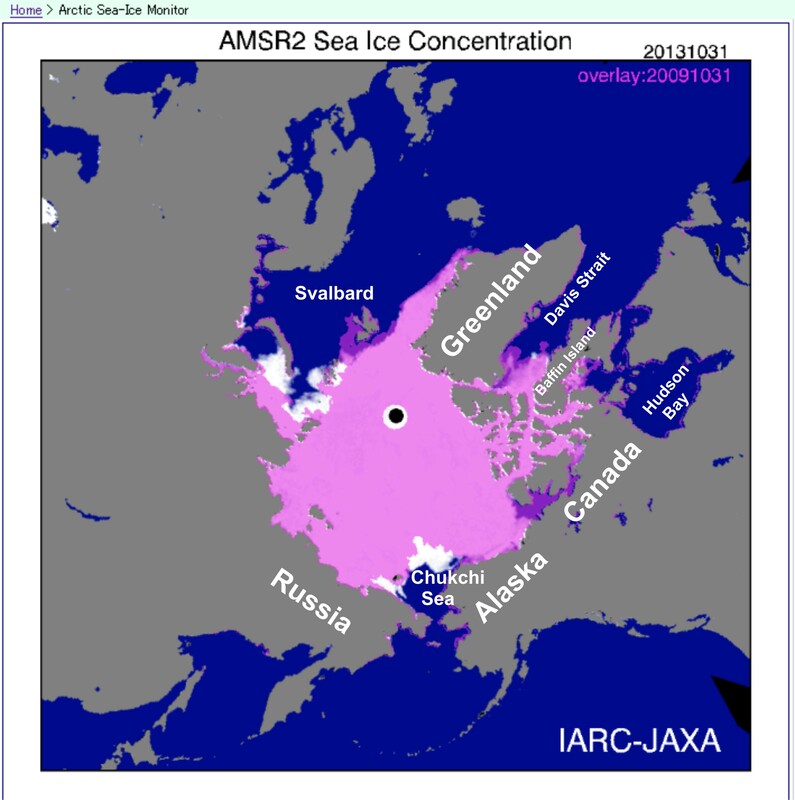 The area around Svalbard in the Barents Sea, as well as the western Arctic below Banks and Victoria Island in Canada, have less ice this year than they did in 2009. It may take 2 or 3 more weeks – perhaps less – for ice to expand to those areas, but by that time, the Chukchi is likely to have even more ice than it does now. It will almost certainly take longer for Hudson Bay and Davis Strait to begin filling with ice – this will perhaps take until the end of November or early December (4-5 weeks from now). Fig. 3 shows what the ice concentration looks like in the Canadian Arctic, especially evident in the eastern Beaufort and Baffin Bay (far left and far right of the ice pack on the map, respectively), where ice is rapidly developing. All that ice, even the “thin” stuff, is good news for polar bears. Work on polar bears in the Canadian Arctic around Baffin Bay (Ferugson et al. 2000) has shown that polar bears there routinely hunt on ‘young ice’ (0.1-0.3m, called “grey-white” young ice on Canadian Ice Service maps). That means ice one foot thick or less is an adequate platform for polar bears to travel and hunt, which should put an end to their summer fast. Figure 2. Difference between sea ice extent at October 31 2013 (white) and October 31 2019 (purple); pink areas had ice both years. This year, there was more in the Chukchi and Kara Seas than in 2009 (the white areas) but less in the Barents Sea around Svalbard and western Canada (the dark purple). Map from JAXA (Japan Aerospace Exploration Agency), labels added. Click to enlarge. Figure 3. Sea ice extent and concentration in the Canadian Arctic on October 31, 2013. Given that ice only needs to be 10-30 cm (about 1 foot or less) thick to support an adult polar bear, even the “young grey-white ice” (15-30 cm thick, according to the Canadian Ice Service) developing at the edges of the pack makes a useful hunting and/or traveling platform for bears. Map from CIS, click to enlarge. 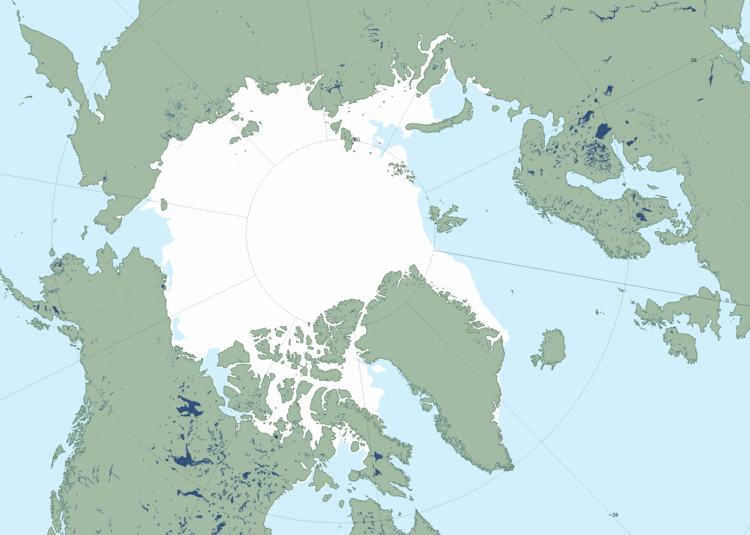 This entry was posted in Life History, Sea ice habitat and tagged Beaufort, Canadian Ice Service, Chukchi, Eastern Beaufort, Ferguson, grey-white ice, Hudson Bay, polar bear, sea ice extent, summer ice minimum, young ice. Bookmark the permalink.